Railpictures.ca - A.W. Mooney Photo: Well before the days of Shared Assets running thru Parry Sound we see the southbound Toronto section of the VIA Canadian stopping at CN Boyne for a crew change. And it is one long train; dome cars must be out of sight around the bend. Note the northbound CN-CP crossover track is being pulled up. This is after the foreground crossover had just been put down. Later, the Minds that Matter had the crossovers reversed again. One never knew what to expect at this popular railfanning spot located along James Bay Jct Rd North, just a couple of miles south of Parry Sound off old Hwy 69. For those not familiar with this area, the left track is CP transcon line, the right is CN’s. The units behind 6513 are 6620 and 6633. A bit of light rain did not dampen my enthusiasm when something like this came along. | Railpictures.ca – Canadian Railway Photography – photographie ferroviaire Canadienne. 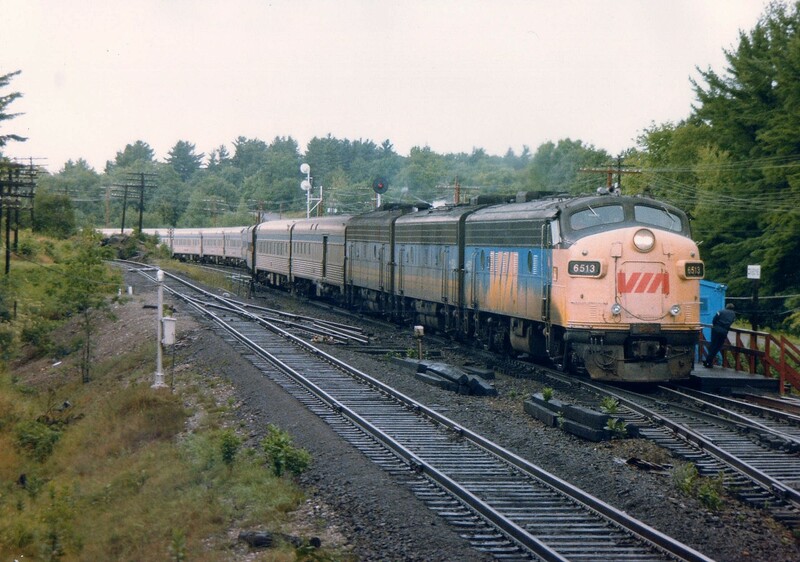 Caption: Well before the days of Shared Assets running thru Parry Sound we see the southbound Toronto section of the VIA Canadian stopping at CN Boyne for a crew change. And it is one long train; dome cars must be out of sight around the bend. Note the northbound CN-CP crossover track is being pulled up. This is after the foreground crossover had just been put down. Later, the Minds that Matter had the crossovers reversed again. One never knew what to expect at this popular railfanning spot located along James Bay Jct Rd North, just a couple of miles south of Parry Sound off old Hwy 69. For those not familiar with this area, the left track is CP transcon line, the right is CN's. The units behind 6513 are 6620 and 6633. A bit of light rain did not dampen my enthusiasm when something like this came along. This photo has been paired with Dave Burrough’s on the Time Machine Page! Congrats! James Bay Jct – there was a bit of corporate over enthusiasm. I can see you spending a lot of time at that spot.